2Work Antibacterial Washing Up Liquid 5 Litre 2W04022 - Norwich Office Supplies - Office Stationery and Furniture for Norfolk with Delivery to all of the UK. Get all your Computer Supplies, Print Consumables, Presentation Equipment, Paper, Desking & Seating Right Here! 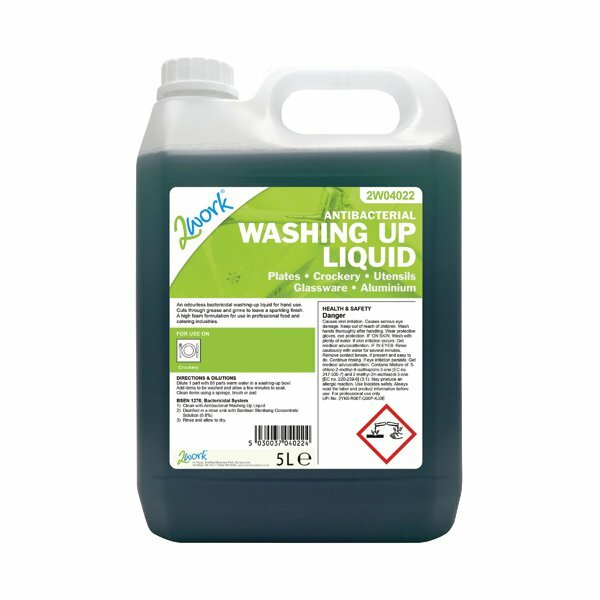 Keep your cutlery and crockery clean and sparkling with this 2Work Antibacterial Washing Up Liquid, which cuts through grease and dried on food to remove even stubborn stains more easily. With a high strength and large size, this product is best used in catering and hospitality environments. This hard working liquid comes supplied in a bulk 5 litre bottle.